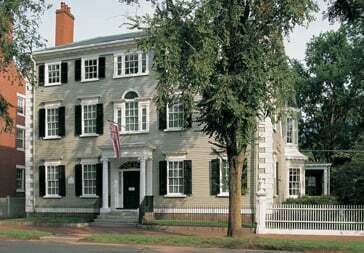 In 1821 four intact rooms from an earlier house were transported by ox sled to Salem’s fashionable Chestnut Street to form the core of a new Federal-style mansion being built by Captain Nathaniel West. Nearly a century later, Anna Phillips bought the house and launched a fourteen-month renovation in the Colonial Revival style. Today Phillips House is the only mansion open to the public on Chestnut Street. When Anna Phillips, her husband Stephen Willard Phillips, and their five-year-old son moved in, they brought with them a family collection that spans five generations and blossomed during Salem’s Great Age of Sail. Enjoy a glimpse into the private world of the Phillips family and their staff during the early decades of the twentieth century. The kitchen, pantry, and a domestic staff bedroom, present a rarely seen picture of how great houses functioned as new technologies were being introduced. Last tour at 4:00 p.m. On Thursday, October 31, the last tour departs at 3:00 p.m.
Free for Historic New England members and Salem residents. From Route 128, take exit 26 to Lowell Street East. Follow signs into Salem, staying straight to end (street name changes). Turn left into Essex Street. At next light, turn right onto Flint Street, and then take an immediate left onto Chestnut Street. Phillips House is the fifth house on the left; entrance in rear of house. Two-hour street parking is available on Chestnut Street. During the month of October, parking on Chestnut Street is reserved for residents only. Two-hour street parking is available on adjacent Pickering and Warren Streets. If you would like to extend your visit, go to the city’s website to lean more about public parking areas within walking distance of Phillips House. Walking from the Salem MBTA Station (0.6 miles): Head southwest on Bridge Street, turn left to stay on Bridge Street, continue onto Washington Street, turn right at Essex Street, turn left at Botts Court, turn right at Chestnut Street. MBTA bus service is also available to Salem. The Federal-style mansion is located on Salem's picturesque Chestnut Street. This room is the finest example of the house's Colonial Revival renovations. Photo courtesy of Lightshed Photography Studio. Here, Anna Phillips ran the business of the household and informally entertained guests. Photo courtesy of Lightshed Photography Studio. Stevie Phillips' bedroom mainly reflects his interests in 1919, when he was twelve years old. The kitchen was a social space for the domestic staff and their friends and family. Photo courtesy of Lightshed Photography Studio. A 1929 Model A Ford is among the vehicles on display in the carriage house. Take a self-guided tour of the carriage house from April to November. Architecturally, Phillips House contains layers of history. From the front, it looks typically Federal in style, with a symmetrical façade, elegant proportions, a grand entryway, columns, fanlight, sidelights, a Palladian window, and a hipped roof. The house also has quoins, which were more common in the previous Georgian period. In contrast, the inside of the house is a combination of the Federal style and fashionable early twentieth-century Colonial Revival styles, as remodeled by the Phillips family shortly after purchasing the house in 1911. This long evolution began in 1800, when Captain Nathaniel West and his wife Elizabeth hired Samuel McIntire to build a grand country estate for them in South Danvers, Massachusetts, approximately four miles from Salem today. Elizabeth was the daughter of Elias Haskett Derby, America’s first millionaire. Unfortunately the West marriage ended in a bitter and public divorce. Elizabeth, determined that her ex-husband should never get his hands on the house, left it to their three daughters. After Elizabeth died in 1814 and the youngest daughter Sarah died unmarried and childless in 1819, Captain West inherited one third of the estate, which equaled four rooms of the house. In 1820 he had those rooms removed from the Danvers house and moved to Salem, using teams of oxen and logs. These rooms make up the front four rooms of the present house. West added a connecting hallway, a third floor, and a kitchen wing in the rear. The West family lived in the home until 1836. The West family continued to own the house into the nineteenth century. By 1836 Malvina Tabitha Ward and her daughter took up residence to run a genteel boarding house and school. In 1863 Nathaniel West’s trustees sold the house to Mrs. Ward for $6,000. In 1875 Sophia Ward, possibly the granddaughter of Malvina Ward, sold the house to Annie B. Webb, wife of William G. Webb, for $15,000. Not an original photograph. Photograph was saved from photographic tour on HistoricNewEngland.org 2010-2015. By 1884 the house had nearly doubled in size to the footprint we see today, including the existing laundry, kitchen, and second-floor guest room. Upon Mr. Webb’s death in 1896, David Mason Little, a relative by marriage, lived at the house with his family until 1903. The Misses King then rented it from Annie Webb, a founding member of one of Salem’s philanthropic sewing circles, the “Cheerful Workers,” until 1911. Over the years the interior and parts of the exterior were changed to reflect various styles that became popular, from Federal to Victorian to Colonial Revival. 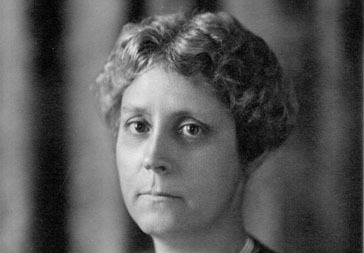 Anna Wheatland Phillips (pictured) bought the house in June 1911 for “$1.00 and various sundries.” Within a few months, she and her husband, Stephen Willard Phillips, hired architect William Rantoul to remodel the house in the Colonial Revival style. Using America’s architectural past for inspiration, Rantoul stripped away the elaborate Victorian interior designs, incorporated large windows to let in the sunshine and fresh air necessary for good health and sanitation, and in the dining room and other spaces recreated a “Federal-style” look. The Phillips family, while appreciating the past as reflected in the beauty of their Federal house, also wanted a comfortable, modern home which reflected their status and wealth; where they could raise their son Stephen, entertain on a frequent basis, and display generations of furnishings and artwork. Two staircases were removed to make way for up-to-date bathrooms, closets, and a great deal of living space. For everyone’s comfort the house was fully electrified and, for the staff, a modern gas stove was installed next to the coal-fired range in the kitchen. Five domestic staff assisted the Phillips family with the running of the house. Three live-in servants, including a cook, first-floor maid, and a nursemaid, were single women who had separate bedrooms in the back wing of the third floor. Two male staff, a coachman/groundsman and a chauffeur, were needed for the horse-drawn carriages and the automobiles owned by the family. The men did not live on the property, but went home at night to be with their families. A selection of carriages used by the Phillipses and three of the automobiles used during this time are on view today in the carriage house. The domestic staff continued to live in the home after Stephen Willard Phillips’ death in 1955. Stephen Phillips died in 1971 and requested that his childhood home be turned into a historic house museum. His wife Betty, residing in the family’s neighboring home, officially opened the Stephen Phillips Memorial Charitable Trust for Historic Preservation in 1973, exhibiting five generations of Phillips family furnishings, art, and antiques. Mrs. Phillips was active in the museum’s administration until her death in 1996. From that point forward, the daily operations and programming were overseen by the board of trustees and one staff person. 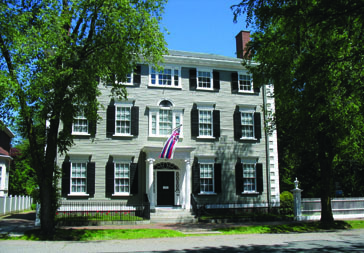 Historic New England acquired Phillips House in 2006 from the board of trustees. The museum offers a variety of public programs that focus on the many stories and objects in the house including an extensive film collection, a variety of antique carriages and cars, and specialty tours that highlight what life was like in Salem in the early twentieth century. Find out about accessibility, photography policy, and more. Are there restrooms at Phillips House? Yes, there are two restrooms, but unfortunately they are not handicapped accessible. When can I visit the Phillips House grounds? The museum grounds are open daily from dawn to dusk. A tour of any Historic New England property requires a considerable amount of standing and some walking. Phillips House has not been equipped with handicapped accessible ramps, elevators, or chair lifts. Folding chairs can be provided for visitors who would like to use them during a tour. We are glad to offer guests a visual tour of the second floor of the museum from the comfort of our visitor center. Visitors with limited mobility may be able to enjoy a first floor tour of the house and grounds. Service animals are welcome. We encourage visitors with concerns to call ahead. We are happy to work with you to make your visit an enjoyable one. Can I take photographs at Phillips House? 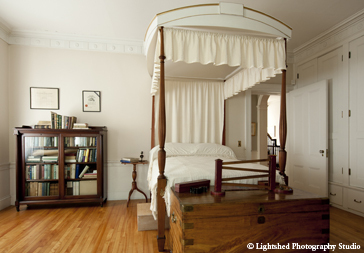 Interior and exterior photography for personal use is allowed at Historic New England properties. For the safety and comfort of our visitors and the protection of our collections and house museums, we ask that you be aware of your surroundings and stay with your guide. Video, camera bags, tripods, and selfie sticks are not permitted. Professional/commercial photographers and members of the media should visit the press room for more information. How can I become a member of Historic New England and get more involved? Join Historic New England now and help preserve the region’s heritage. Call 617-994-5910 or join online. Do I need to take a tour or can I just look around? All visitors to the house receive a guided tour. A self-guided tour of the carriage house is available May – October. Tours of Phillips House are approximately forty-five minutes long and focus on how the Phillips family lived in the house around 1919. How long has the house been open for tours? Mrs. Bessie Wright Phillips established the museum (her husband’s childhood home) in 1973 as a memorial to her husband’s family and the sailing ship era of Salem. When did Historic New England acquire the house? In 2006 Historic New England acquired the Stephen Phillips Trust for Historic Preservation House from the family. Phillips House became the thirty-sixth Historic New England property. What is the flag that flies in front of the house? The Hawaiian flag flies because Stephen Willard Phillips was born in Hawaii in the 1870s while his father, Stephen Henry Phillips, was attorney general under King Kamehameha. 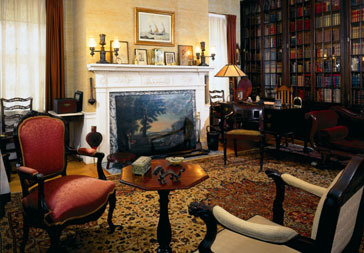 Captain Nathaniel West and his wife, Elizabeth Derby, built the front four rooms in 1800. The rooms were moved to 34 Chestnut Street in 1820-21. 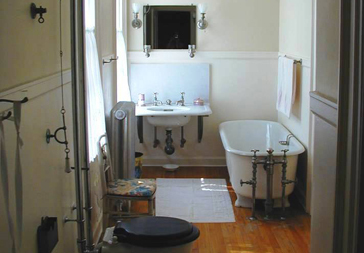 Changes were made throughout the house’s history in the Victorian and Colonial Revival styles. When did the family last live here? Stephen Willard Phillips died in 1955; however, members of the domestic staff lived here until 1962. Is there a connection between the Phillips family of Phillips House and Phillips Exeter and Andover Academies? Yes, they all descended from the Rev. George Phillips, who came from England on the ship Arbella in 1630 with Governor Winthrop. Are the fireplaces made of plaster? No, they are carved out of wood. Parts may be a composite of wood and plaster. Were the mantels carved by Samuel McIntire? We are not sure; parts of the front four rooms may have been designed by him, someone of the same school, and/or his son, Samuel Field McIntire. They came from a house called Oak Hill, where McIntire did work. When was the carriage house built? What cars are in there? The carriage house was built in the 1820s. Inside you can see the Phillips family’s antique cars and carriages. There is a 1929 Model A Ford, a 1924 Pierce Arrow Touring Car, and a 1936 Pierce Arrow Limousine. What is upstairs in the carriage house? There may have been quarters for a stable hand or groom on the left side before the Phillips lived here. The right side had grain and hay for the animals. The Phillipses used it as another storage area. Approximately 10,000 square feet of living area; approximately 11,500 square feet including the attic and basement. Visit nearby Gedney House in Salem. Visit Cogswell's Grant in Essex, Mass. Become a member and tour for free. Salem, Massachusetts, is America’s Bewitching Seaport. Located on the Massachusetts coast sixteen miles north of Boston, Salem is easily accessible by car, train, and seasonal ferry. Most noted for the Salem Witch Trials of 1692, Salem is rich in American history, maritime heritage, art, architecture, and culture. Its varied accommodations and unique shopping and dining make Salem an appealing destination for all ages. Salem was recognized as one of the National Trust for Historic Preservation’s Dozen Distinctive Destinations in 2005, and the American Planning Association recognized Salem as one of their Great Places in America in 2009. Contact Destination Salem or the Salem Chamber of Commerce for listings of restaurants and lodging, and many more local activities.